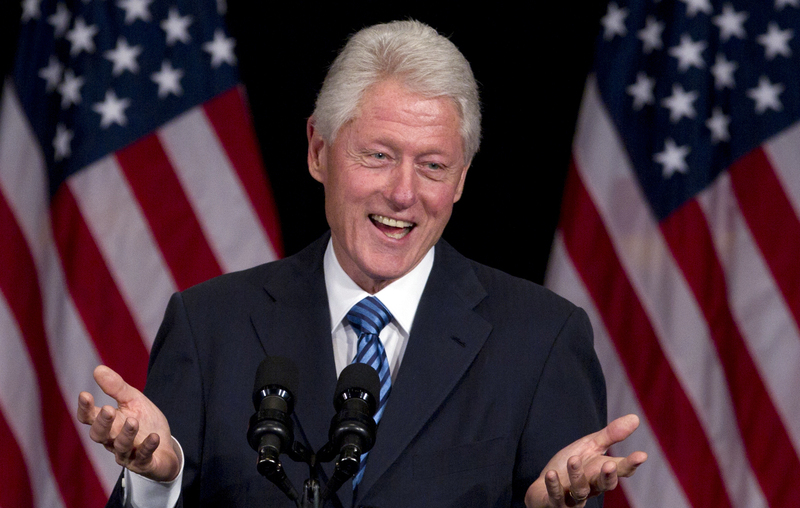 During his 1992 campaign for the presidency, Bill Clinton proclaimed that if he was elected the county would benefit because it would “get two for the price of one”, him and Hillary. Now there are indications that, with Hillary slipping in the polls, Bill plans to hit the hustings again to reinforce the “two for one” mantra. If that’s true, he may bring more controversy than help given his tarnished past. Part of that past is his association with Laureate Education Inc. In 2010, he signed on to become an “Honorary Chancellor” for Laureate International Universities, part of Baltimore, MD-based Laureate Education Inc. In return for serving as a front man for the privately held for-profit education company, Clinton collected $16.5 million between 2010 and 2014. Laureate also has donated between $1 million and $5 million to the Clinton Foundation. While Clinton worked for Laureate, he and the company consistently refused to say how much he was being paid, but an analysis of the Clinton’s tax returns in July revealed the numbers. In the statement released with their tax returns, Hillary Clinton said of their financial success, “…we owe it to the opportunities America provides.” Well, that’s one way to look at it. 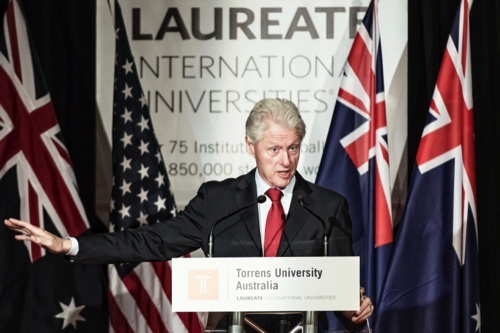 Clinton resigned his Honorary Chancellor position at Laureate in April 2015. “Laureate students represent the next generation of leadership. I have seen a commitment to quality and leadership throughout the Laureate network, and I have enjoyed being a part of it,” Clinton said in announcing his resignation. Clinton may hold the Laureate network in high regard, but if he’d done his homework he’d have found a lot of reasons not to sign on to Laureate’s marketing campaign (aside from avoiding blatant money-grubbing). Even Bill’s wife has been critical of for-profit colleges. “Unfortunately there are some programs that take people’s money and do not produce the results that were promised, and we’ve got to crack down on that and put them out of business,” Hillary said during a June 2015 event at Trident Technical College in South Carolina. Laureate has 86 schools serving about 1 million students online and on physical campuses in 28 countries across the Americas, Europe, Asia, Africa and the Middle East. It’s 5 schools in the U.S. include: NewSchool of Architecture & Design, San Diego, CA; Santa Fe University of Art & Design, Santa Fe, NM; Kendall College, Chicago, Il; University of St. Augustine for Health Sciences, St. Augustine, FL; and the online-only Walden University, Minneapolis, MN. Laureate also operated The National Hispanic University in East San Jose, CA, but it closed in August 23, 2015. The San Jose Mercury News attributed the closure to the U.S. Department of Education reducing financial aid and online opportunities for students enrolled in programs that did not offer good prospects for employment. Other media reported that the school also failed to meet its goals in enrollment for online coursework. Laureate grew out of the K-12 tutoring company, Sylvan Learning Systems, in 2004 when Sylvan was spun off. The company was taken private in a $3.8 billion deal in 2007. Investors included KKR & Co., Soros Fund Management, Paul Allen’s Vulcan Capital, Steve Cohen’s SAC Capital Advisors, Citi Private Equity, Sterling Capital and others. This entry was tagged Bill Clinton, Hillary Clinton, International Finance Corp, Laureate, Laureate Education Inc., Laureate International Universities, NewSchool of Architecture & Design, Torrens University Australia, University of St. Augustine for Health Sciences, World Bank. Bookmark the permalink. Laureate is now in a class-action lawsuit against graduate students. My wife is on the faculty of one of their universities in the PRC. Last year the faculty protested and demonstrated due to their low salaries. They are paid about $500/month. They have many other responsibilities outside the classroom. A foreign teacher for 4 years at this school told me that the living conditions were terrible, low salary and he’s required to teach extra courses due to fact that another foreign teacher didn’t show up. He’s not compensated for these extra courses that he must teach.